Welcome to our 2017 Newsletter!! 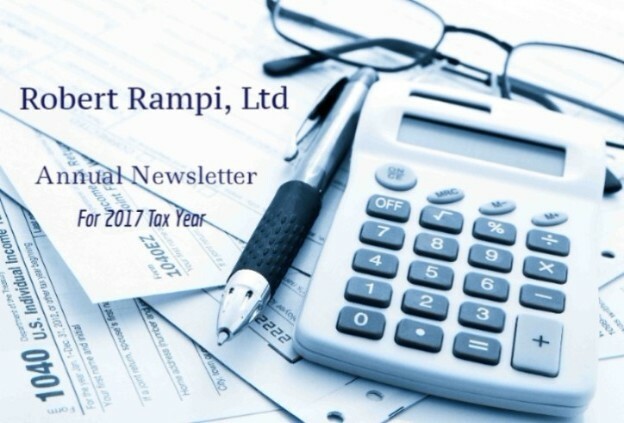 This is our preferred way to keep you up to date with the latest tax changes that impact you, so we ask that you keep your e-mail and contact information up to date by clicking on "Update my subscription information" at the bottom of any newsletter. If you wish to be removed from this list, simply click "unsubscribe" at any time. Pay Your Invoice Online: We continue to use Freshbooks for our invoicing. Don't worry, we still take cash and checks; we can also process your credit / debit payment by phone. Call our office at 763-533-9460. 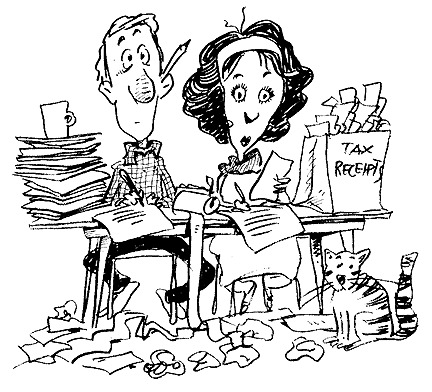 Our tax fees include a 1/2 hour meeting with Robert, electronic filing of your return, and direct deposit/debit set-up. Our tax fees do not include audit support. Charitable Contributions of autos, boats, and planes for which the claimed value exceeds $500 must meet rules that can limit value of the donation to the amount the charity sells the item for. When providing Long Term Care insurance information for possible credit, please provide premium and policy number information. All cash donations exceeding $250 must be accompanied with detailed receipts. The IRS requires donors to keep receipts (cancelled checks, letter from donee, or written record of donee, date and amount of contribution) for ALL charitable contributions no matter the amount. Report all Roth payments for 2017 so our system can keep accurate records. This is a fillable form can be emailed or faxed to our office. Or bring the completed form to your appointment. Pastors: Your documents are now downloadable, click on the form you need and print. Housing Allowance Organizer - Use this to report to us how your W-2 Housing allowance was spent. Also use to report non-reimbursed out-of-pocket ministry expenses to us. Fair Market Rental Valuation – This is used to calculate your main residence FMRV that we may determine your highest deductions. Housing Annual Designation – Use this to request your 2018 housing allowance from your Board. You MUST call our office before this date if you need an extension. Copyright © 2017 Robert Rampi Ltd, All rights reserved.